If you liked Digger, Vol 1 you might like these books. 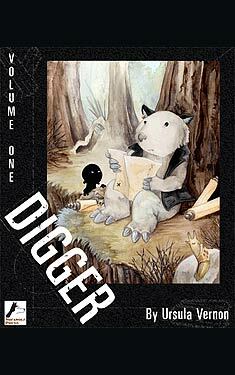 Digger is a story about a wombat. More specifically, it is a story about a particularly no-nonsense wombat who finds herself stuck on the wrong end of a one-way tunnel in a strange land where nonsense seems to be the specialty. Now with the help of a talking statue of a god, an outcast hyena, a shadow-being of indeterminate origin, and an oracular slug she seeks to find out where she is and how to go about getting back to her Warren. With an irreverent sense of humor and a fantasy protagonist with a healthy dose of skepticism, Digger rapidly gained a huge following of devoted fans eager for the twice a week updates of the webcomic. This volume collects the first two chapters of the story, along with an all-new six page comic revealing the origin of the talking statue of Ganesh. Digger has long received acclaim from fellow artists and webcomic critics.